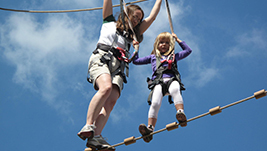 Parents can help kids or adults can help adults as you pass across ropes and through fun balancing feats. Totally exciting - totally safe. check it out! In the Greater Lansing area or close by and feeling like a really fun challenge? You&apos;ve got to check out the new ropes course at spare Time Family Entertainment Center. Outside the main building (which has bowling, laser tag, a video game arcade and more inside) there is a big two-story structure upon which patrons are encouraged to climb, dangle, balance and swing. I literally just got done trying it and let me just say it was a blast! I personally love heights. No butterflies in this stomach but I do get a charge out of being up in high places and its fun to climb around knowing what you are doing is exciting - but also safe as can be. First you are harnessed in so there&apos;s no way you can fall but you also have all kinds of hand holds and balance points on the various obstacles. There is a lower ropes course for the faint of heart and for your children and then there is some nice high up stuff for thrill seekers. Cost is great too as its just a couple bucks for kids and $8 for adults. Put your money down, get harnessed up by their friendly and qualified staff and then take to the course for as long as you want. What a great idea for a kids party or a corporate retreat - or just a fun way to spend a few hours of your day. I&apos;m going to see what my family thinks of the new ropes course at Spare Time but I can tell you right now what I think - Awesome! Find out more about it at the Spare Time website! See you at the course!